Many of us have wondered what would be the result of a mid air collision between a paraglider and a drone quadcopter. Well, as of yesterday I can tell you. I note that we have only had our new POTUS for little over a week and we are already suffering from drone strikes here in Hawaii. Actually, I launched Manics into beautiful NE conditions. Frankie AWOL was already buzzing around above and as I was pulling up I heard him call out to someone that I was launching. In the air, I see a black drone flying at my level a ways in front of me, not paying it much mind I wrongly assume is might be the RC guys back at Crazys, that I trust completely. As I am climbing out above the Lookout, I turn left to track back over Manics and in my peripheral vision I see something dark fly into my lines on the left side about mid level. I instinctively think it is a bird because of the dark color, but with the whining sound I register that it is a drone. It wraps up in my left side A-lines and causes me to start turning left. It thrashes around for a second, motors sounding full throttle chopping and popping on my lines and it does something unexpected. It comes racing down my lines like a crazed giant black spider towards my face. I don't know if it oriented it upside down, the lines wrapped on the rotor spindles, just gravity, or possibly some combination of all three but it happened fast. I instinctively put my had up to grab it as it wrapped up just above the riser thrashing wildly. 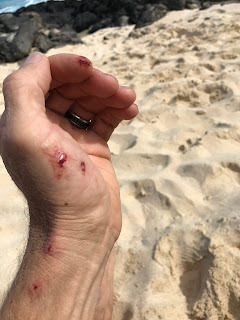 It feels a little like sticking your hand in a weedwacker, those little blades nick me with a dozen little cuts on my hand and forearm. Any rotor you aren't holding on to keeps spinning and thrashing about. In that moment of grabbing the drone and the left turn it caused, my 18m acro glider naturally swings back to the right pretty steeply. I am at about 50' over Manics and pull some left brake with my right hand and square off into the wind. Most amazingly of all, no lines appear broken or even damaged. I have calmed the drone down in its knot above my left riser and see a guy in the lookout in that classic drone controller position. He actually yelled to me to let go of his drone, I told him to shut it off, which he didn't or couldn't do. I take stock and the glider is flying quite normally, I climb for some altitude in the super smooth air and head out to land near the LZ. I realize that with all that thrashing about and the drone is almost loose, so I help it the final way out. The drone is now in my hand, but with two rotors spinning wildly it does have a bit of torque. I probably should have looked for an off switch, but it slipped my mind at the time. I then figured I would give it back to the owner, maybe topland and hand it to him. But that drone kept being uncooperative. I decided to toss it to him from a low altitude above the Lookout, but with so many people around I thought that was a bad idea. So I tossed it like a Frisbee low over Manics, funny thing is I wasn't really low or even over Manics. It fell like a brick onto the cliff edge and shattered into a bunch of pieces. The guy went down there , probably to see what was left of his expensive toy, but that drone had it coming, and he left shortly after. I had nothing good to say to him anyway. I flew around for a while, but while the glider lines looked fine, I felt I should probably give them a serious inspection on the ground and avoided cranking them up for the rest of the flight. On the ground, I checked out the glider lines, not a nick or a bulge or a scratch. It sounded bad when the drone hit, I wasn't sure how there was no damage except to my hand. It would have been great video if I had a GoPro on, or even if I was nice to the drone guy and got his video. I had even forgot my phone, so I recorded nothing, hence the title above. Frank might have a little more insight, but I never got to speak to him. What is important is that I didn't end up in a heap on the rocks, so all is well that ends well, I guess. I saw it happen, and thought you handled it really well. What struck me was the total disregard from the drone operator, or perhaps he didn't realize, how horribly it could have gone. And yet he was yelling out as if it was the paraglider's fault. I am a visitor, but maybe we could co-ordinate to put some signs in to say to be aware of non-motorized gliders limitation and respectful of airspace. Since it is such a popular lookout site, i foresee growing use of drones especially from people who are not used to sharing space with gliders. Well, thanks for the story I guess?! I am glad that you are SuperDave cause that would have most likely sent mere mortals to the ground. I don't think, well I KNOW, I would have handled the drone operator with much less courtesy than what you wrote. Signs may have to be inevitable but to get that passed by municipalities would most likely be met with a "PFR" (permanent flying restriction)! Everyone needs to be aware that these are on the rise, sort of speak, and we will have to self police by asking drone controllers to put them down when we have any PGs close to ground. (Launching and landing). I still say the best recourse is my wooden friend from Louisville, lucky for that guy I wasn't hanging around. All RC aircraft are technically only permitted at RC parks or on private land. Drones flying at public lookouts and beaches are outside the law. However I also fear that getting into any legal disputes would jeopardize our ability to launch and land in those places. So glad you are OK Dave!! Glad you're okay! You definitely handled it more diplomatically than I would of. That drone would have at least went for a swim. The drone operator is definitely in the wrong here. Public Law 112-95, Section 336 states they must yield right away for all manned aircraft. Generally speaking, the more maneuverable the aircraft, the more it must yield right of way. So although you're very maneuverable in in the 18M, it can literally fly circles around you (preferably filming) and thus must give way. I wonder if he was on VR googles, otherwise he should have seen you! Anyway, glad you came out okay. This very attractive technology in here now and most of the people are can see more attractive scenery to use the self flying drone camera. So thank you so much to give us more information about the selfdrone camerea and I hope every students are like this so much.